In anyone's hand right now and say what's that? They would say it's an astronaut from NASA! That's pretty awesome. Out of all of the statues I think this one put's the point over clearly and the best. Do you agree with that? It's common sense that I should talk about this one but if you look at them all, they all are an ancient Alien statue package. 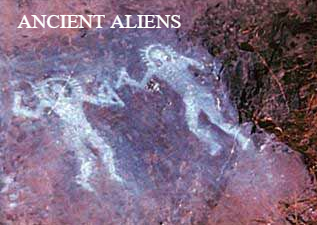 They all convey the message that ancient Gods, ancient astronauts was real. 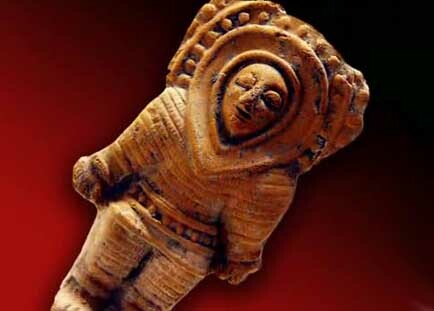 Here's another ancient astronaut statue I have discovered online (ages ago) which for me shows everything you would ever think of as an ancient Astronaut would look like? I can see the nuts and bolts or rivets holding the airtight visor on the space helmet, can you? A bit more on that further on. Can you see the air breathing apparatus aswell? 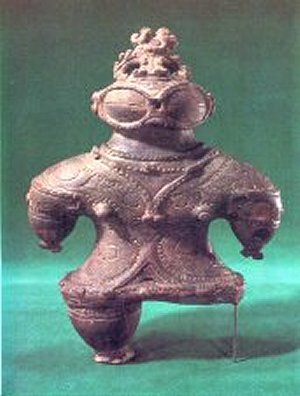 That means "they or the ancients must" have first hand knowledge of the space environment because you can't breath in space so they knew that they need to have an airtight space helmet with a breathing apparatus, well that tell's me that these are real ancient astronauts or probably real Ancient Gods to the locals or humans? Almost every culture and religion the world over has some sort of origins story and are always involved with a visitor from space, so why the hell don't we involve these "visitors" in official origins facts? There's loads of proof for it so I don't understand it, do you? Why don't we (the people) research these origins stories and origin legends and put more faith in well, faith? It's not just a few "local" legends or stories passed down from one person to another person or from one generation to the next that I am saying is the undeniable evidence and proof - but rather it's based in these actual physical and exquisite ancient statues with intricate and futuristic designs and (what we can recognise and understand today) symbols that are mind blowing because we can recognise them today. These ancient astronauts are wearing obvious looking spacesuits in obvious looking spaceships wearing a science instrument called a breathing apparatus, helmet, gloves, backpacks and wearing a space helmet that has a visor which the person inside can clearly see out of and then there's the the nuts and bolts that hold the visor in place! They have to be science instruments because they are wearing these in space. The testing of these ancient science instruments is something they must of done so again, it's almost like a piece of this modern time slipped back in time just like a record player skipping a few groves on the record itself and took the energy ONLY with it and plonked it down in the ancient times for anyone or anything that's capable of accessing it. It seem's plausible to me? Especially as Tesla did invent and create a wireless electricity machine. So sending a file of energy back or forward is just semantics. It feel's like it is possible but I just don't know how to do it, do you have any ideas on how to send a file of pure or raw energy like a package of electricity? Space is technologically intricate and scientifically mind blowing. It takes years and years even decades and decades of teams of geniuses to create what we see now? Imagine then what it took to create the vehicles we see in the statues and the spacesuits but way back in the past. These are things of magnificence in today's world. It take's seasoned artisans and science experts with degree's and degree's of degree's to create a spacesuit. It takes an army of NASA employees to create a rocket and an engine so the mind boggles when I compare the technology in these ancient statues to today's technology and when I see what goes in to making and building the modern day equivalent's - it is undeniable and well frightening to think of what or who these ancient Aliens where because immediately I think time travel. I think it's us going back in time to well, give us a start? Everything is out of not only place but also out of time aswell. Space, time and the continuum is out of whack. 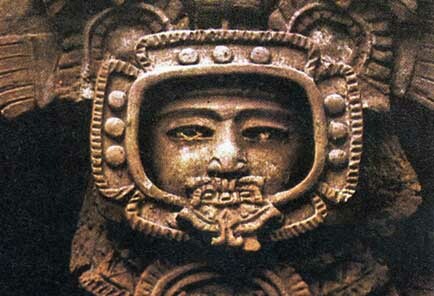 You can see a rocket engine on the famous Mayan Palenque - Maya ancient astronaut with aerodynamics and an eye sight tracking system like Google Glass. There's peddles for his feet and levers, computer instruments on a dashboard and there's even fire coming out of the rocket engine(s) thruster(s). These's vehicles which this Palenque one shouldn't even be in the minds of the most knowledgeable person of the time. It shouldn't even be possible for any of the more way out there or fantasists to know about. Especially down to the intricate level that all these things go together in this vehicle which we recognise right now. It is an ancient anomaly the likes of which instantly triggers a red flag as far as i'm concerned and tell's me that time travel or secret knowledge is real, it is a very real people through the times have either achieved or gained somehow through either divine intervention or given by a time traveller or a secret book of knowledge exists and is in strict confines handled by a few families and is only looked at when needed? I believe this is real and attainable. The ancient peoples shouldn't of known of such vehicles and it begs the question, what else dis they know? What else "do" they know? All of this, they shouldn't know of and more over, they couldn't know of the future but yet it seem's that they did - there it is in physical tangible form right in front of the eyes! Ancient Alien's and ancient Astronaut's living in the past is a definite yes. Not only in myths and legends but in art and in cultural expressions also cultural mythology. In this article, we look into the life and history behind King Pakal, the ancient city of Palenque and the sarcophagus lid; “bulletproof” evidence of ancient astronauts according to the Ancient Alien theory.